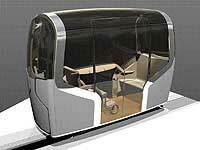 Design of a Slim Ride rail cabin for up to 15 passengers. Watch the Slim Ride video or watch the Campbell Live item. 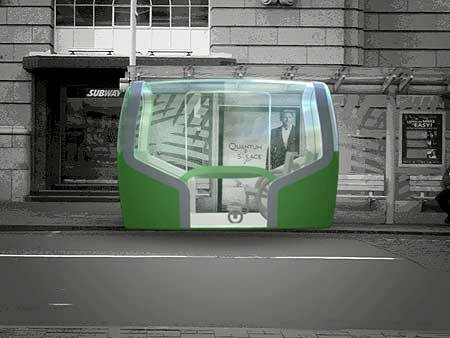 A driverless, electric-powered light rail system designed to whisk commuters more efficiently around central Auckland and across the harbour bridge could appeal to people who snub existing public transport, says its creator. 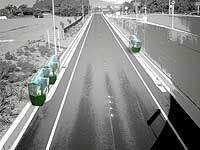 Industrial designer Oliver Neuland, from the University's Auckland School of Design, has developed what he believes is a workable, affordable and stylish way to cut congestion in the inner city and Northern Motorway. Mr Neuland is a former motorcycle designer from Berlin, who has been at the Albany campus for three years, teaching transport and industrial design. He has also taken a personal and professional interest in ways to combat the traffic problems that bring Auckland to a crawl and cost an estimated $1 billion a year in lost productivity. His Slim Ride rail design consists of compact, stylish rail cabins with a lounge-like atmosphere and automated doors for up to 15 passengers each. Based on a similar model, London's Docklands Light Rail, the Slim Ride system would be neatly linked to existing transport networks by a series of loop tracks, shunting passengers constantly around the inner city as far as Mission Bay as well as to northern suburbs across the bridge. "The technology is more closely related to roller coaster systems than to classic rail technology, making it an inexpensive, low-tech option that's easy to build, operate and maintain locally," he says. "To operate in Auckland's infrastructure limitations, the track is planned to be extremely slim, a hybrid between a ground and above ground – around fence height – sections and based on an inline-rail layout." 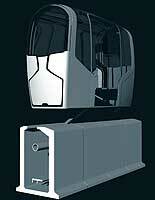 Mr Neuland came up with the design after doing field research on the city's often-maligned bus and train system. Many people shunned public transport because of its bad image, considering it unreliable, confusing and risky, he says. "The confusing patchwork of individual bus lanes sharing the congested road corridors does not help make public transport more inviting," he says in a report on his design, recently published in the journal of the Railway Interiors Expo in November in Cologne, where he presented his concept. As well as improving transport for commuters, he envisages Slim Ride could also add kudos to the city as a unique transport of mode for tourists. He has been in discussions with Maori artists regarding artwork to give the cabins added character and aesthetic appeal. "Instead of offering a cold, technical and vandal-proof interior, the design creates a 'lounge' atmosphere, clearly differentiating it from Auckland buses' poor image. Research suggests that appealing aesthetic design is less liable to be attacked by hooligans." Mr Neuland has developed a working model with track layout and chassis configuration, as well as video animation to demonstrate Slim Ride's feasibility, and says it could be adapted to any city. "It could also work as a last-mile system for shopping malls, corporate centres, business parks and university campuses." He hopes his design will provoke debate about the need to improve the city's public transport amid moves to Auckland's Super City structure. He plans to further refine his Slim Ride through consultation with transport engineers with a view to creating a pilot track to test it.